Transcription by: Maku-chan and Seed. Translated and compiled by: Beno. 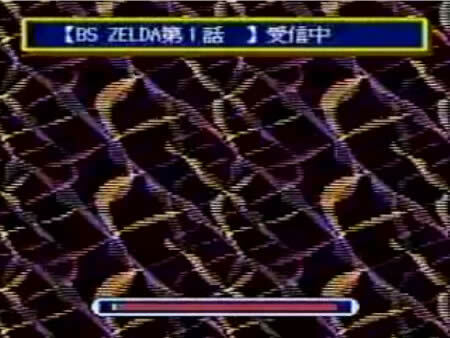 What follows is the translation (with pictures) of a video taken during the original broadcast of week 1 for BS The Legend of Zelda Map 1. 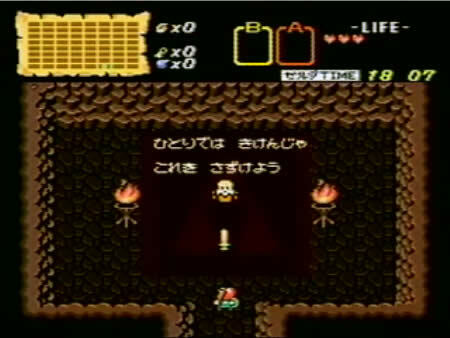 As you may tell from the text, the voices of the old man in the first cave and a narrator accompanied the player through most of the game. The video also proves that along with voice acting high quality music was streamed, playing the same track (and voice acted dialogues) for all players regardless of their locations and actions. 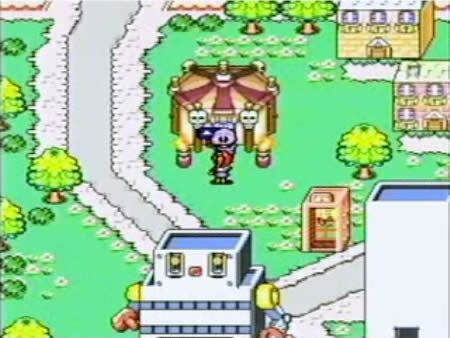 The music Roto was able to enable within the game must have been coded earlier on in the development of the game, before Nintendo decided to ditch it and use this other solution. Fortunately, it was not removed entirely from the rom. 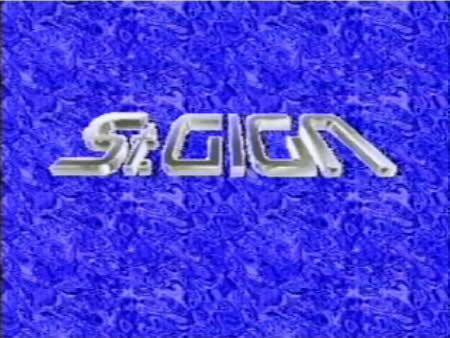 Here you may download the first part of the video with the introduction of the game that was seen while it was loaded into the BS-X, and the second part showing the actual gameplay. This area is the new event house. Do you want to go play? This will use all your memory, is that all right? 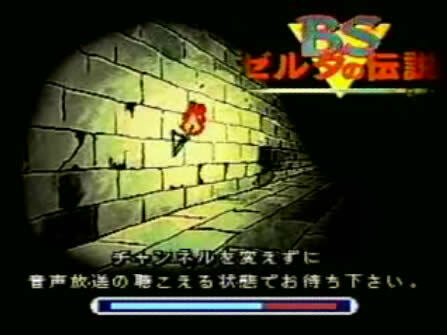 BS Legend of Zelda Ch. 1 is being downloaded currently. This program is a new game program that via satellite circuit lets you play this game at the same time as many other players all around the country. You can enjoy the high sound quality of voices and BGM only with the BS. 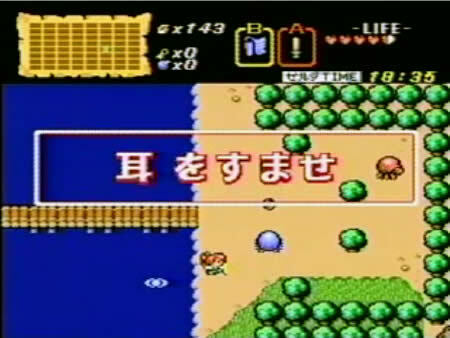 Therefore, this game program will only exist during the time you are playing Zelda. It is not possible to save that in the memory pack. 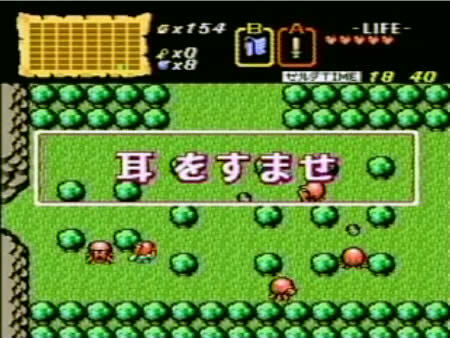 Now please enter the magnificent world of Zelda. A long time ago... The Gods created this world. The Gods left behind the holy gold triangle, the Triforce, as proof of their great power. The ruler of power. The governor of wisdom. The forger of courage. 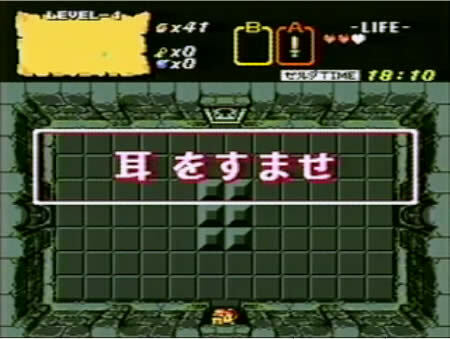 The Triforce carries these three crests and until the appropriate person comes, it sleeps unknown in the holy land. Ahem, so it's you? I've been waiting. The golden power descended from heaven rests somewhere. By touching it, the Gods will deliver you your desire. This phrase was handed down in Hyrule. 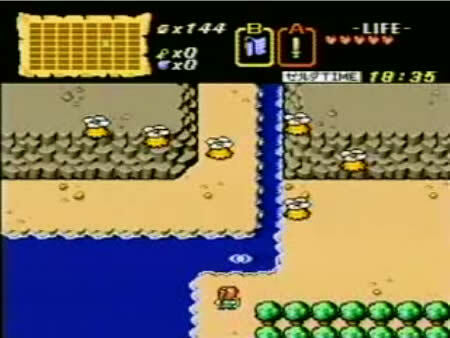 The Golden power, the Triforce, when touched it your desires come true. The said legend attracted people and they scrambled to search for the holy land. This event is performed every Sunday. When the fourth story ends you will receive the password for subscription. 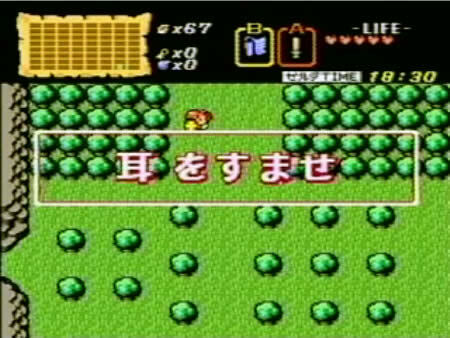 Of course if you get a good score, other people will be able to see that on the memory pack. Now, would you please enter that door. 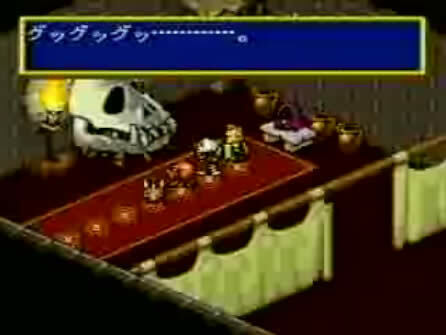 on the Triforce was the boss of a thief gang, Ganondorf. 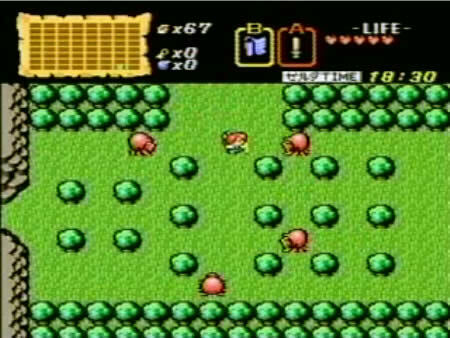 The Legend of Zelda was released in 1986 and became a very popular game. 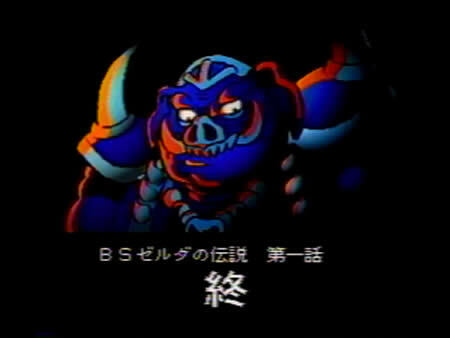 Indeed this is the time when the King of Evil, Ganon, was born. 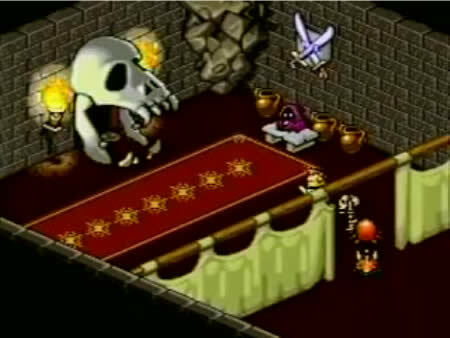 Before long Ganon's evil power spread across Hyrule, and one by one sinister events began to occur. 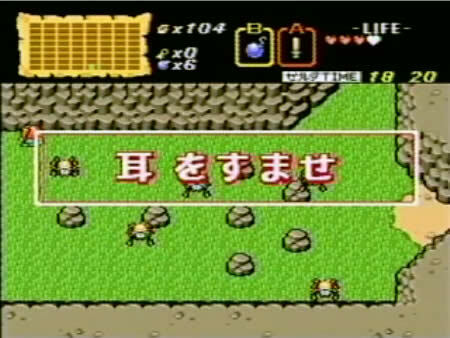 The game was an action role playing game which heightened the Legend of Zelda's popularity. 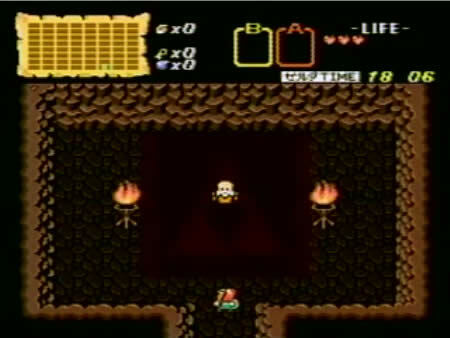 So, the Hyrule king ordered the seven sages and the knights to seal the source of the evil power. 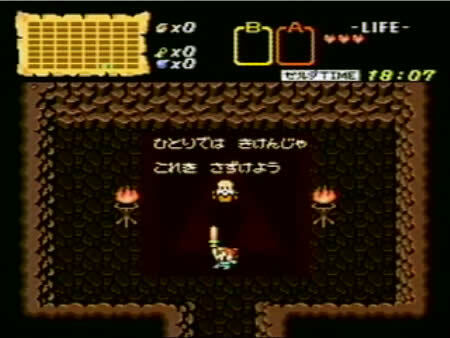 In order to repel an evil kidnapping of the Triforce, Hyrule's people were informed by a divine message of the Gods to create the holy sword able to defeat evil power, the Master Sword. 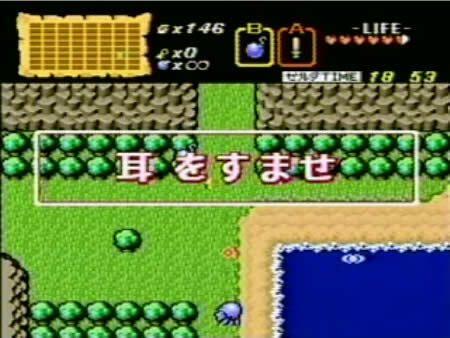 The legendary country, "Hyrule" was the great stage for the adventure and has remained in the hearts of many people. 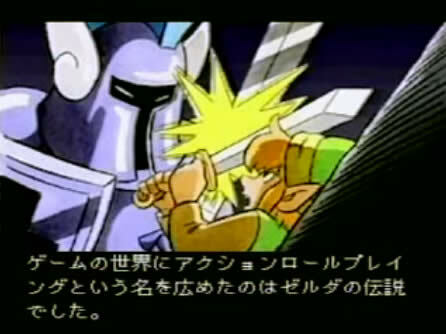 But, even with the seven sages it was not possible to handle the holy sword, the Master Sword. Bottom: The channel is changing. Please wait while the audio loads. Everyone waited for the hero who would be able to handle the holy sword, the Master Sword. 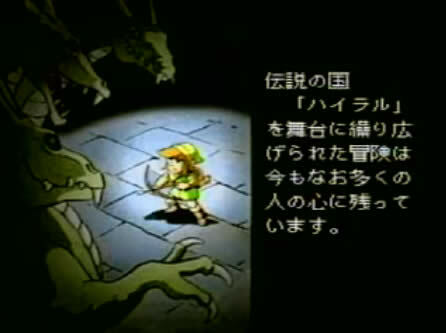 But as they waited for the hero, Ganon's evil power reached the royal palace where an grand battle unfolded. After the fight in which there were many sacrifices and the sages were successful in their seal, it came to be called the Seal War. 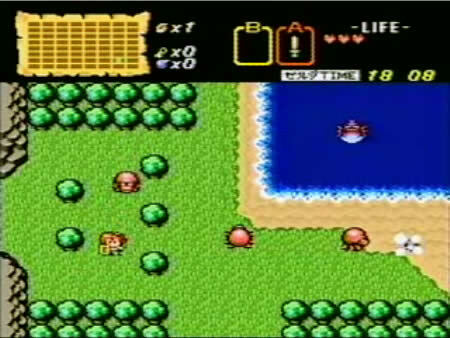 Once again, Hyrule was visited by peace. My name is Princess Zelda. I have been trapped in the dungeon by evil power. Hero, hurry and rise! Hyrule! Hyrule is in danger! The peace of the moment is destroyed by the mysterious message. Hurry, hero! You must bring peace back to Hyrule once again! Come, hero. The people of this world were waiting for the time when you would appear. Ah, I am very pleased. 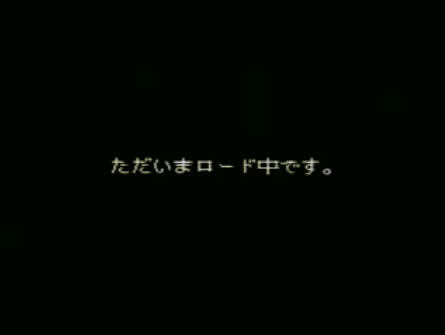 You followed the guiding star. We knew you would come here. Good hero. 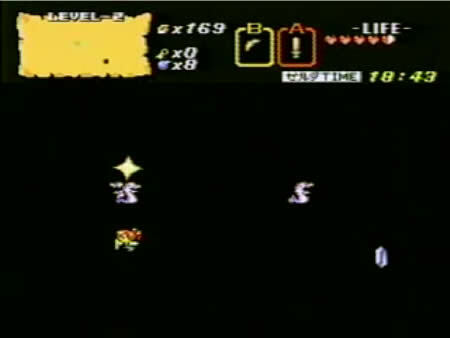 You must collect all of the Triforce to be able to defeat Evil King Ganon. I will give you power here. One more thing. This is very important. This world only exists for a certain amount of time. When the time comes this world will disappear like an illusion. 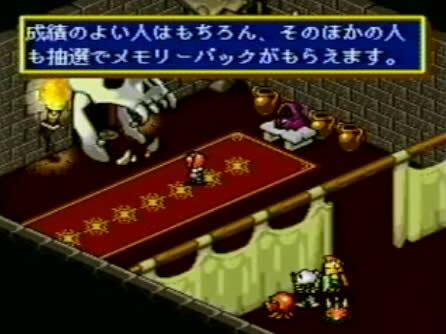 To begin with, search out the Devil King's labyrinth that is in this area. Hurry, hero. Wield this sword. It is dangerous to go alone. I grant you this sword. 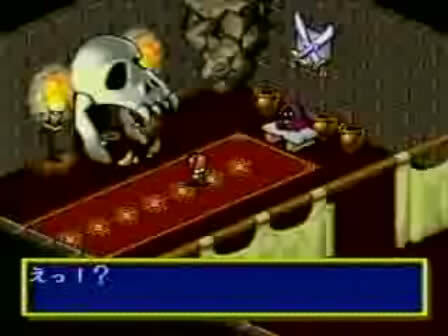 Setting of on your journey, there are some things you should remember. To handle your sword use the A or Y button. Try pushing it now. Next, the X button is used for things you acquire. 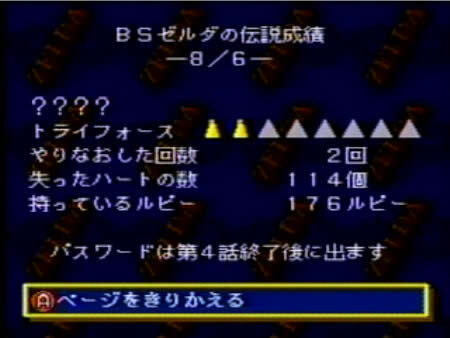 This screen is called the subscreen.This screen shows the things that you carry lined up. 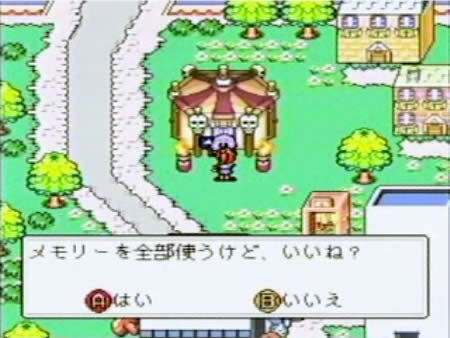 To use these things at anytime, after choosing the item, return to the game by pressing the X button, and then use the B button to handle the item. To the change the item you are using, go back to the subscreen with the x button. You can also change using the L and R buttons. Well then, I pray for your good fortune. 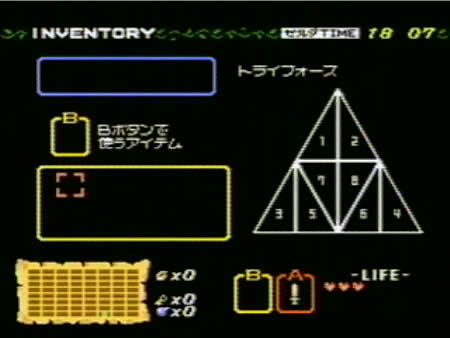 According to the the old man, the Triforce is in the evil king's labyrinths. There are many of these labyrinths. This week, boy, you must find level 1 and 2. 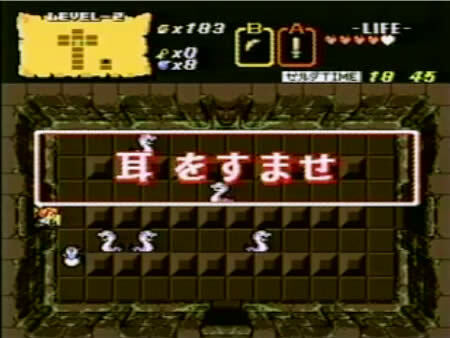 The first labyrinth should be found quickly. But, the second labyrinth is said to be somewhere hidden. Above ground and in the labyrinths the evil king's followers will be after you. If you are fighting enemies, your power may run low. If this happens, the fairies will protect you. The fairies dwell in springs. Hero, where are you fighting? With your current power, no doubt your fight is difficult. Now for a small time, I can give your sword power. Good, now listen closely to my voice. You must fight now in this place and carry out your mission or we will lose. So, even when your life is not full, you will be able to shoot beams, huh? 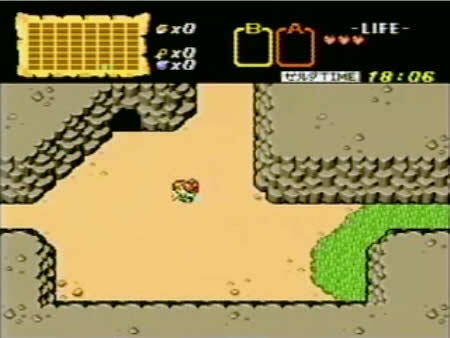 To buy things from the merchants, it is necessary to have money called Rupees. Bombs and keys - you should always be cautious of the number of Rupees you have. The number of rupees you have is shown on the above screen. Have you found the bombs, young one? You use the B button for bombs. In this world, they say you can use bombs to reveal openings in the walls. Particular in labyrinths, there are statues of faces embedded in the wall. They says bombs will break these stone statues. Also, they say there some riddles you must solve by moving blocks. Listen well, hero. I see a heart container. Surely, it must have drifted up on the shore. I can hear the waves. Get the heart contained, it will surely help you in your fight. 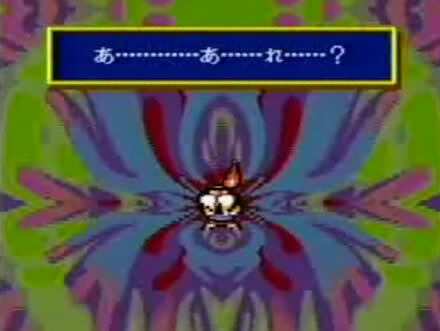 What's wrong? The fairy who lived in the spring has disappeared. Surely, this is the evil king's doing. This is not good. You must find the fairies' whereabouts. 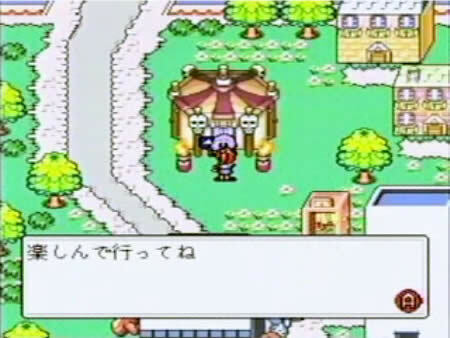 The fairy spring is empty. 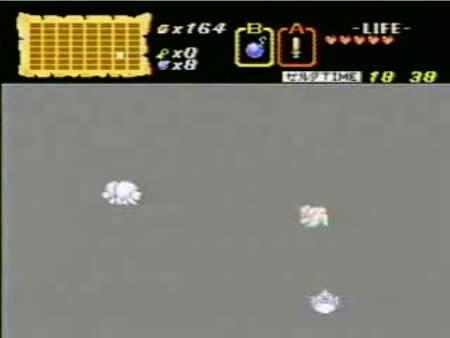 It seems like the work of Ganon's power. Without them, the fight will be painful. You must be careful. Now if you are hurt by enemy, a fairy wont appear. This is very dangerous. You need to get some life recovery medicine. 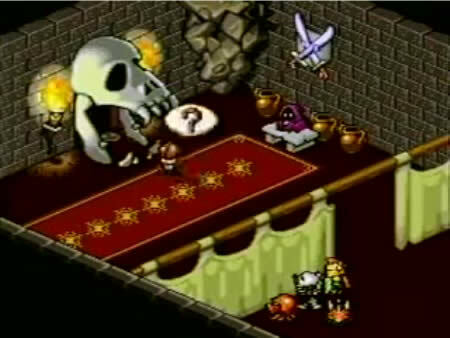 It seems the fairies' locations can be figured out. Thus, their powers can be borrowed. You should be happy, they're friendly to you. This new technique you were taught will serve you well, try it out! 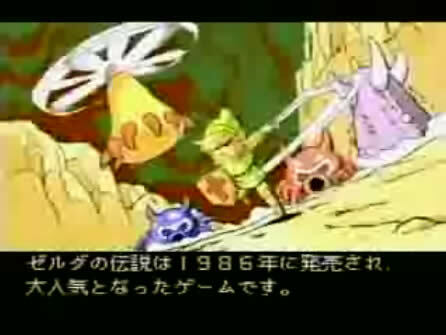 Now, the fairies are your ally. It will be advantageous to go into battle with this. Now, I found the technique in the prohibited book that I was concerned about. This should be some help in your fight. The fairies have gone back to their fountain. It seems they left to escaped from the evil king's power. The spring has recovered it's power. The fairies will help you by lending you their power there now. Fight with a strong heart. I found in the book, the best technique, the end of the chapter of thunder. I will use it right away. Now, I see a strange scene. 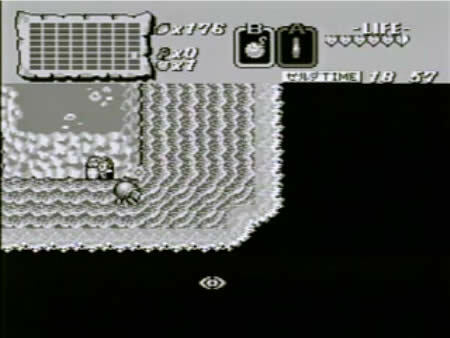 A monster, a rock, a broken down wall, smoke and figure of a person walking. That was not my power. Perhaps the same power of the stars that brought you here has given this to me. Let me hand this down to you. 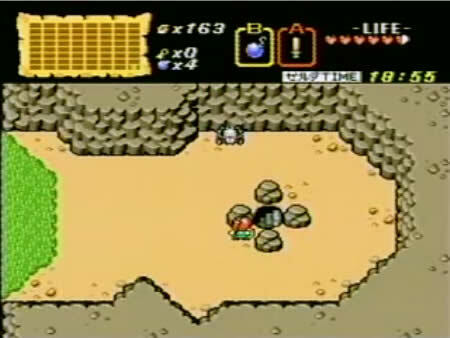 Hero, the bombs power has vanished. The star's power is growing weak. You must hurry. Also, my power will not last forever. This world will soon disappear. Soon this world will disappear. Hurry! Please hurry!! Time has finally run out. The password will be given at the end of Week 4. You have done well, Hero. From here, I have watched your braveness. You have fought well here today, but your mission is not over. 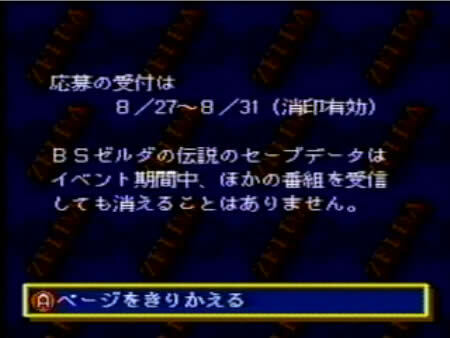 The save data for BS Legend of Zelda with not vanish during the event period or when receiving other programs.